Have you got a special occasion to celebrate? Why not have a pink flamingo party on your lawn? 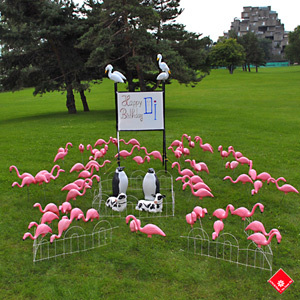 At the crack of dawn our Flamingo Man will install an assortment of lawn decorations in your Montreal yard, along with a large custom yard sign for everyone to see. There’s nothing quite like a yard full of pink flamingos to create a truly special surprise! At the end of the day, we'll return to take down the lawn decor so that you can sit and watch the best cartoons ever made on television. You can also choose from the Do-It-Yourself options to install your own memorable lawn decor surprise. We also offer options indoor displays. For more information, call The Flower Pot, your Montreal florist at 514-938-1234. The beauty of flowering plants is obvious to all. The impact of beauty and color that many flowering plants bring to a garden is something that is desired by almost every gardener. If you are careful and organized with your plantings and arrangement of the flowers in your garden, you will make sure that there is a continuous display of blooms throughout most of the growing season and for years to come. this is a really neat idea, thanks.